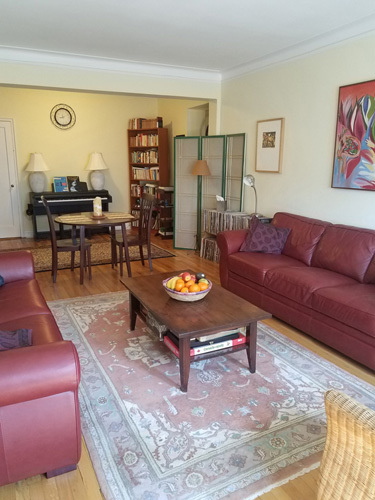 Why be in a sterile, characterless corporate rental, when instead you can live in a charming, comfortable private home in downtown Stamford? 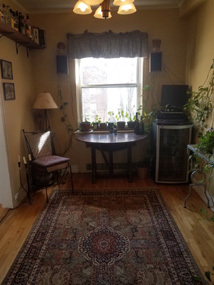 I'm looking for a responsible, clean, non-smoking professional to live in my sunny, spacious furnished apartment, a few minutes' walk from the downtown area. $1,550 per month includes off-street parking, very fast (200+ Mbps) Internet, electricity, heating, hot water, gas. And if you don't like carrying shopping from your car in the rain, a private indoor heated garage parking spot is available for an additional $55. Top (third) floor apartment in a quiet well-managed condo complex. Short walk from shops, downtown restaurants, theaters, bars, local businesses etc - see Location. Lovely oak hardwood floors and oriental rugs throughout. Great kitchen with new appliances, granite counters, loads of storage space. 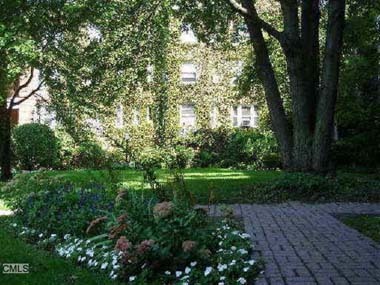 Pretty, well-maintained gardens, with a separate grilling area at the back of the building. Please note - this is actually a 2-bedroom, 2-bathroom apartment but I now live in Belize. 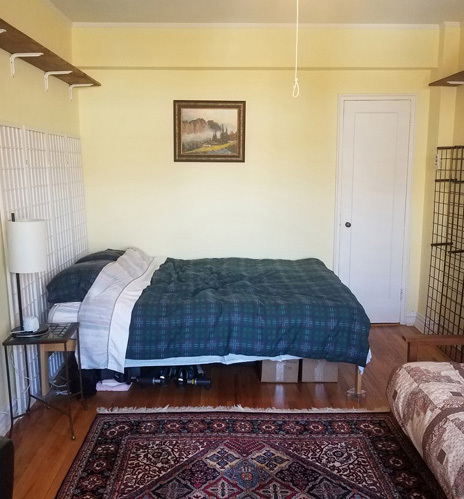 I’ll be back in Stamford periodically, maybe for a week or so every 6 weeks, so while I’m away it's effectively a 1-bedroom, 1-bathroom apartment that you'll have to yourself - my bedroom/bathroom will be locked. Minimum duration 3 months. Favored applicants will commit to 6 months or longer. All applicants must have a full-time job. Sorry - no smokers, and no pets. Please note that the apartment is a 3rd floor walk-up with no elevator, so you’ll have to be able to manage two flights of stairs! Viewing - The apartment is available for viewing from today (April 10, 2019). Please contact me via email (stephen@scollins.net) or by phone/text (203-391-4159) if you'd like to come and see the place. The more you tell me about yourself (your job, who you work for and for how long, how many months you think you might want the place, your lifestyle etc) the more comfortable I will be with the idea of sharing my home with you. Payment terms - Initial payment of three months' rent required - first month, last month and deposit. When I decide who to offer the apartment to, a non-refundable downpayment of the first month's rent will secure it, with the other two months due when you arrive. Thereafter the rent needs to be deposited directly into my bank account on or before the first of the month (my bank is 5 minutes walk away, or you can pay online to my JP Morgan Chase account). Other Stuff - You would pay half of the cleaning costs. The apartment is cleaned every two weeks and costs $120 per time. The apartment needs to be kept clean and tidy. While there is a TV and a Blu-ray player (for NetFlix, Hulu etc) in the living room, there is no TV service in the apartment. If you want to have TV I can have a cable box installed and add the incremental monthly cost to the rent. And if you want a TV in your bedroom I have a spare 28" TV which you can borrow. 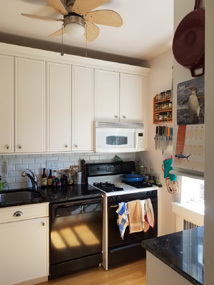 There is no washer/drier in the apartment (the condo association does not allow it) but there are two clean and well-maintained laundry rooms downstairs, each with three washers and three driers. References and Credit Check - I may require a prospective tenant to provide references, including a letter confirming employment with your current employer, and/or a recent credit check.